Are you keen to work as a hair stylist? In many countries you need a professional certificate or diploma to start working on this job role and in some countries experience is all that matters. Whatever be your situation, you must give proper attention to the application format, so that you are perfect and get the best attention from the salon authority. To get hired the CoCover Letter Examplesver Letter Example for Jobs is the main key, and you must make sure that the presentation is pretty professional and precise. Templates are available to make this a doable project in much lesser time. 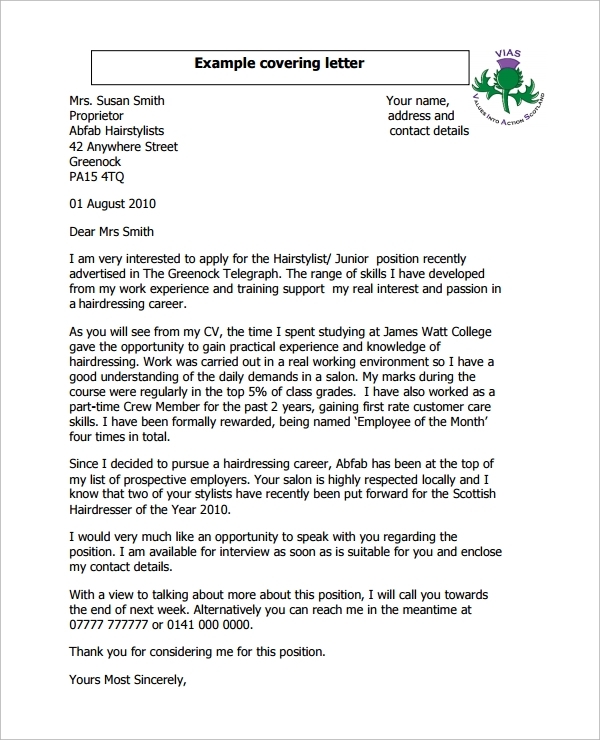 If you are applying as the junior hair stylist, then you would need this template for the cover letter. The junior hair stylist is one who is little experienced in the field, and may or may not be a fresher. Therefore the cover letter may or may not tell about your experiences, but should show your enthusiasm to work under a senior and learn the ways. If you are a fresher, then this cover letter will be apt for you. The template will make your cover letter guided in case you have no experience of writing a cover letter, and are looking for the best ways to impress the management. Your enthusiasm to work as the entry level hair stylish should be well visible through the presentation on the letter. The professional hair stylist cover letter would be different and will have a lot of experiences shared. Naturally the letter would tend to get long as points are mentioned. However to keep it precise and to the point, the template plays a good role in guiding. You can get the cover letter free for download. When do you need the cover letter template? The cover letter template is most needed when you are a novice and have little idea of how to impress the recruiter through your application. Even experience people get confused about the best writing pattern, as these are not the things you usually write every day. That is why a well guided format is needed. Once you get a free format, you can then do some addition and deletion to make it your own way. This makes presentation easy and saves time and effort. To apply as a hair stylist try getting one such guided template which will make it easy for you. 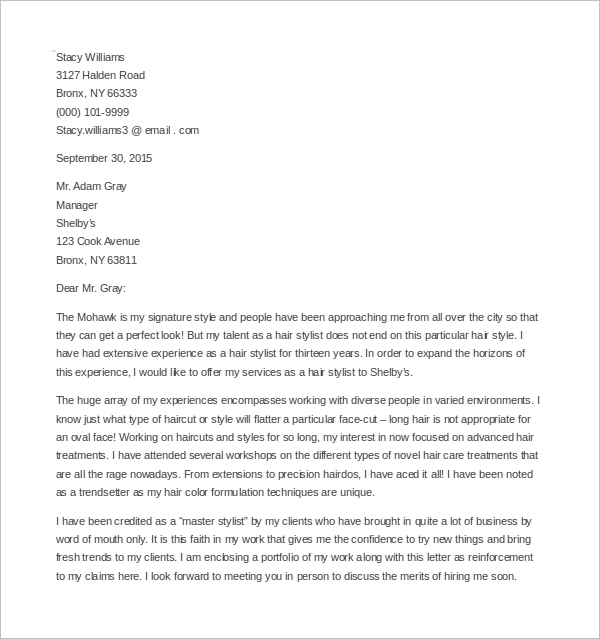 The hair stylist cover letter is important for many reasons. Hair stylists do not generally deal with a lot of writing etc. Their main job revolves around styling and beautifying the hair. That is why they are miles away from writing stuff and practice. If they have to suddenly write a letter it would be time taking, tedious, and full of errors due to their inexperience in writing. That is why the Cover Letter Examples are important. The templates make it a smooth path. You simply have to follow the format and your letter gets ready in minutes. Where do you get a hair stylist cover letter? 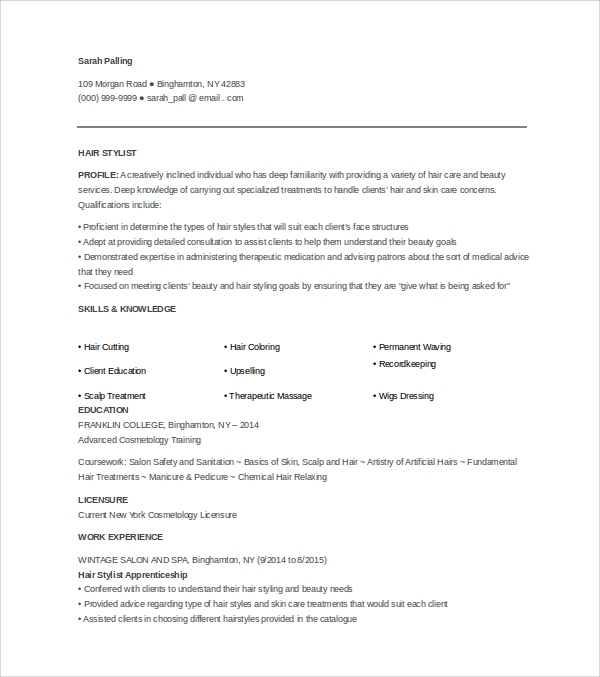 Cover letter templates for the application of hair stylist position are available for free download online. You can get a copy of the letter and start customizing it with your last experiences, and the zeal to work again with the new body, and how you are a good stylist etc. 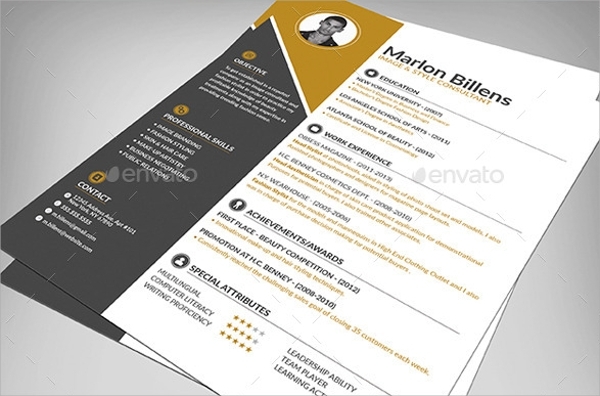 Customizing a cover letter template takes minutes only, and soon you will get a complete letter. You may save the template for future use, and apply with it in future jobs as needed. It’s about how nicely you present your experiences and working enthusiasm on the cover letter. This will get you selected. The language may be difficult to frame if you are a novice, and this should be a proper mix of energy, experience, qualifications, enthusiasm, and the zeal to work and learn. Templates are there to guide you through the same format.